The sight of a tattoo gave me my thesis idea! On the arm of a Ghanaian working colleague was a tattoo representing “Gye Nyame” (an Akan ideogram meaning “Omnipresence of God”). Very intrigued, I started to question him about it, then search for more information on the internet, then read about the topic of ideograms in Akan societies and found other ideograms. One of them was “Sankofa”, which was the main theme I decided I wanted to research. More commonly seen as a bird facing forward but looking behind for a forgotten egg, it represents the proverb “It is not taboo to go behind and pick up what has been left”. I argue it represents their particular conception of history and defines their relation to tradition, that is what my whole thesis is about. In undergraduate studies (in International Relations), I wrote a lot of my papers on politics in Ivory Coast (which I was interested in for no other reason than it was my then-boyfriend’s country of birth). I also took a couple of class concerning Africa & Political Studies but was always surprised by the academic lack of interest for the influence of cultural values. For my Masters thesis, I decided to study how theories were used as normative tools and became convinced that norms and values were what regulated the social relations and therefore the debates over them was more political than politics. 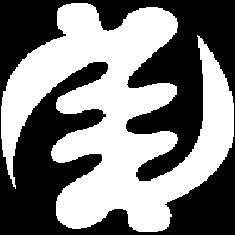 Gye nyame - Akan for "The Omnipresence of God"
I started to read about “adinkra”, the ideograms of the Akan people of Ghana, just out of curiosity, without any academic intent. It has hundreds of symbols, each of which is coupled with a proverb. I thought it was a fascinating conceptual system. Then I started to extend my readings and became interested in the transmission of tradition and conception of history among the Akans. At one point I figured out that it could be a good, and very original, topic for a PhD in political studies. Isabelle Bernard is currently doing a PhD in Political Studies at University of Ottawa on ‘Transmission of values through oral tradition among the Akans of Ghana’. You can follow her on Twitter at @IsabBernard.